My industrious sister had been at it again. If you remember, my older sister stops by once in awhile to share her major DIY accomplishments. She is amazing. Check out her other projects here and here. Despite the fact that she is pregnant (expecting around Halloween) and already has 4 children, and she works (seriously, feel bad about yourself yet?! 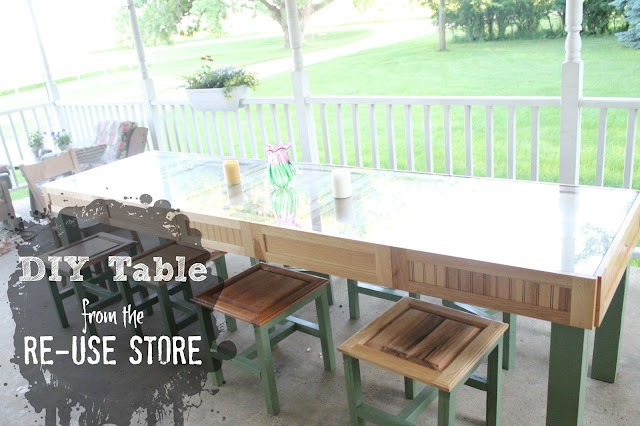 ), she has put together her most impressive DIY construction job yet: A table made from cabinet doors and drawer faces, all found at her local reuse store. She put together this beautiful table without taking any pictures (clearly not a blogger) but I just had to showcase her work. She has this table sitting out on her porch and her family heads out there almost every meal. Her family lives on a quiet gravel road, and after the kids are done eating they just head out into the yard, grab their bike or a baby kitty and start to play. Magical, right? As you can see, she once again took advantage of the beautiful cabinet doors in this project. First she constructed the table structure and then laid out the cabinet doors on top. Next, she used drawer faces to line the sides of the table. Finally (and here is where it got a little expensive) she ordered a large, heavy pice of glass that is held in place nicely by the drawer faces. Finally, she made several stools from square shaped cabinet doors. That full tutorial can be found here. 1. She is skilled with power tools. 2. She is one of those people that can do anything! Look, she made her own table–while pregnant–and working! Who does that? 3. She lives on a quiet gravel road and her family eats almost all of their meals outside. I hope you have as fabulous of an older sister as I do. Thanks for stopping by–and thanks Ruth for being so freaking amazing! That is such a creative idea! I love it! So great to have a talented group of sisters:) thanks for sharing this! That table is gorgeous – what a creative idea. Thanks for sharing! Pinning your post and following you on Pinterest, Google +, Twitter and email.